Remember this name: Hubert Sumlin. You’ve heard his incredible guitar sound. All that started when Hubert was just eight years old, and he broke the one string on his brother’s homemade guitar. Yep, Hubert’s older brother’s prized possession was a cigar-box guitar with only one string. Hubert used to mess around on it while his brother wasn’t looking—until one day, Hubert broke that only string. His brother was furious. Hubert thought he was gonna beat him up bad. Man was he devastated. But their mother was watching what was going on. She knew Hubert had some real skills in him. So one day she came home from work with her arms wrapped around a real guitar—one with all 6 strings. Hubert’s brother was jealous. But the rest was history. 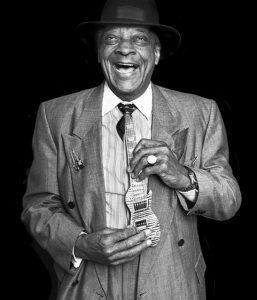 Hubert Sumlin played on some of our favorite blues songs. But even though he came up with some of the coolest riffs ever, he mostly stayed behind the scenes. He’s the one who backs Howlin’ Wolf on all his best tracks. Played with Muddy too. Clapton, the Stones, if they’re guitar gods, they became so by listening to the likes of Hubert. Wanna hear why? How bout a little “Spoonful” of Hubert Sumlin?